Originally constructed between 1883 and 1887 to commemorate the 100th anniversary of the peaceful end of the Revolutionary War, the Tower was built at the site where Washington was headquartered the longest during the Revolution. The original roof was damaged by a hurricane and removed, closing off access to the rooftop viewing platform that provided amazing views of the Hudson River. But now, after nearly 70 years, the Tower finally has its roof and observation level back! 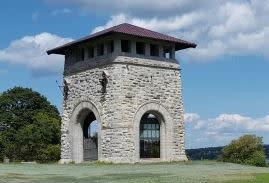 It took six years of work and the support of hundreds of Newburghers, foundations, businesses, volunteers, and the State of NY, and so, with great excitement we invite the community back to visit the Tower, to climb the stairs to the top, and take in the views once again.